(CNN) -- Controversial new rules changes to Formula One which would have seen the world champion decided by race wins have been shelved until next year. 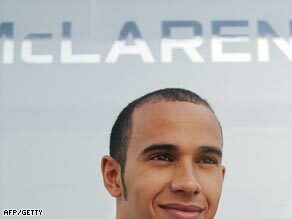 McLaren star Hamilton is defending his Formula One title this season. Motorsport's world governing body FIA made the climbdown late on Friday in face of opposition from leading drivers such as Lewis Hamilton and the Formula One Teams Association (FOTA) who said it would challenge the decision. "If, for any reason, the Formula One teams do not now agree with the new system, its implementation will be deferred until 2010," FIA said in a statement, effectively bowing to the demands. FIA had ushered in the new rules at a meeting on Tuesday, a move described by seven-time champion Michael Schumacher as "astonishing." Reigning world champion Hamilton had kept his council until Friday while he tested in Spain, but his reaction to the changes, which also include caps on team spending, was outspoken. "I think it's a shame what's happening to Formula One," he told Press Association. "It's hard to believe these recent decisions will improve things for the trackside spectators and TV viewers, who should always be our number-one priority, but I guess we'll have to wait and see. "Whatever the points system, I know all Formula One drivers will always race our hearts out." Under the new rules Hamilton would have finished second in last year's championship to Ferrari's Felipe Massa, who had one more race win. Citing the global economic downturn, FIA will push ahead with their plans to limit the budgets of Formula One teams. For next season they will be forced to choose between freedom to spend, but keeping to the current technical regulations, or the ability to innovate, but with a £30 million cap on their spending. Hamilton added: "For the first time in recent years we have the teams, drivers, sponsors and fans all working together for the good of our sport -- now we just need the governing bodies to listen to us and help us. "Formula One is the pinnacle of motorsport and that's what we all love about it. We should all be working together to maintain that." Ferrari president and FOTA chairman Luca di Montzemolo was highly critical of the changes and felt the new regulations run "the risk of turning on its head the very essence of Formula One and the principles that make it one of the most popular and appealing sports." Other drivers, including two-time champion Fernando Alonso of Spain and Britain's Jenson Button also expressed their disquiet at the way the new changes were imposed. FOTA wanted a system of awarding 12 points for a win, against the current 10, but F1 commercial rights holder Bernie Ecclestone pressed hard for the system based on race wins, with points only used if there was a tie between two or more drivers. The new season starts on March 29 with the Australian Grand Prix in Melbourne.